John McCain dead: The great McCain and Mo Udall story you’ve probably forgotten, from Michael Lewis. What an old anecdote about Mo Udall in the hospital reveals about the late Sen. McCain’s character. 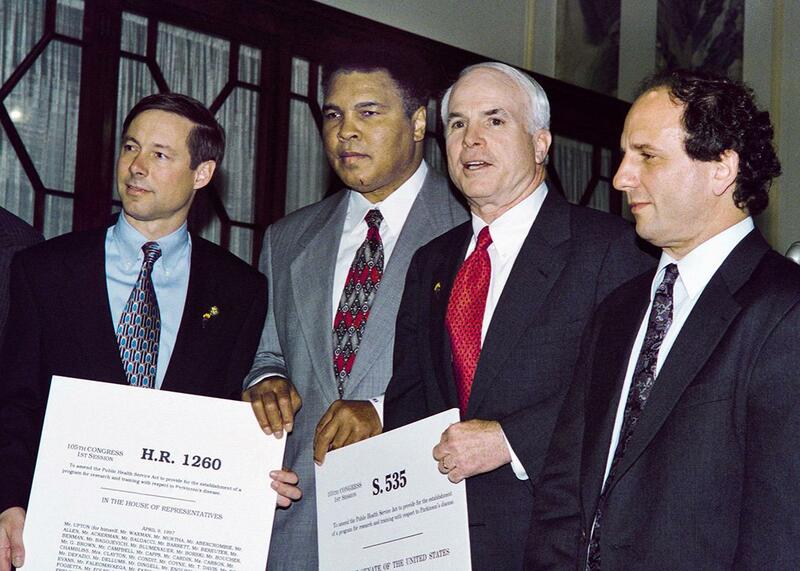 Fred Upton, Muhammad Ali, John McCain and Paul Wellstone in Washington D.C. on April 23, 1997. After a battle with brain cancer, John McCain died on Saturday at age 81. Back in 1996 and 1997, before McCain was a presidential candidate or object of media fascination, Michael Lewis followed the Arizona senator around as he campaigned for Bob Dole and worked to reform campaign-finance laws. Lewis’ pieces for the New Republic and the New York Times Magazine portrayed McCain as a passionate, cantankerous, astonishingly honest political character who frequently acted in ways that brought him no political gain. Following the senator’s death, we remembered a wonderful moment from Lewis’$2 1997 New York Times Magazine profile of McCain, ”The Subversive.” The passage below comes at the very end of Lewis’ article. For the past few years, Udall has lain ill with Parkinson’s disease in a veterans hospital in Northeast Washington, which is where we were heading. Every few weeks, McCain drives over to pay his respects. These days the trip is a ceremony, like going to church, only less pleasant. Udall is seldom conscious, and even then he shows no sign of recognition. McCain brings with him a stack of newspaper clips on Udall’s favorite subjects: local politics in Arizona, environmental legislation, Native American land disputes, subjects in which McCain initially had no particular interest himself. Now, when the Republican senator from Arizona takes the floor on behalf of Native Americans, or when he writes an op-ed piece arguing that the Republican Party embrace environmentalism, or when the polls show once again that he is Arizona’s most popular politician, he remains aware of his debt to Arizona’s most influential Democrat. On the way out of the parking lot, McCain recalled what it was like to be a nobody called upon by a somebody. As he did, his voice acquired the same warmth that colored Russell Feingold’s speech when he described the first call from John McCain. “When you called Feingold … ” I started to ask him. But before I could, he interrupted. “Yeah,” he says, “I thought of Mo.” And then, for maybe the third time that morning, McCain spoke of how it affected him when Udall took him in hand. It was a simple act of affection and admiration, and for that reason it meant all the more to McCain. It was one man saying to another, We disagree in politics but not in life. It was one man saying to another, party political differences cut only so deep. Having made that step, they found much to agree upon and many useful ways to work together. This is the reason McCain keeps coming to see Udall even after Udall has lost his last shred of political influence. The politics were never all that important.